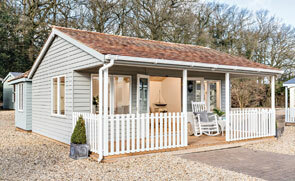 One of our charming Blakeney Summerhouses was recently installed for a customer based in Royal Tunbridge Wells, Kent. Designed in a traditional chalet-style, the Summerhouse is from our range of high-quality, FSC® certified timber buildings and was selected by the customer to be a year-round retreat. As with all of our buildings, the Summerhouse was designed and hand-crafted at our factory in Norfolk before being delivered and installed by our in-house fitting team. 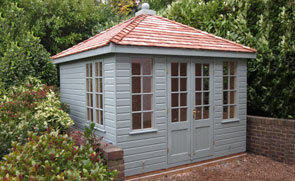 This attractive Blakeney Summerhouse was recently installed for a customer based in Tonbridge, Kent. Selected from our hand-built range of FSC® certified timber Summerhouses, the building was both delivered and installed at the customers’ address by our expert, in-house fitting team. This stunning Superior Shed was recently installed for a customer based in Kent who previously ordered a matching Wiveton Summerhouse with the same two-tone paint finish in Lizard and Ivory. Our Superior Sheds are the ideal high-quality sheds with a variety of optional extra features such as workbenches, electrical packs and additional security measures. This charming Wiveton Summerhouse was recently installed for a customer based in Ashford, Kent. The perfect garden retreat, our Wiveton Summerhouses are hand-crafted in our Norfolk factory using only FSC® certified timber and are then both delivered and installed to our customers. With it’s quintessential summerhouse style and a distinctive octagonal roof, it is the perfect choice for those wanting an attractive addition to the garden. This stylish storage solution in the form of a Superior Shed perfectly finishes off this garden in Rochester, Kent. Clad in smooth shiplap and painted in Valtti Black, the shed also has a sloping pent roof and is a compact size of 1.8 x 2.4m. 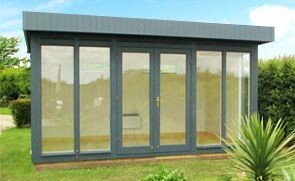 This traditionally attractive building is our Garden Room: it is 4.2 x 6.0m, and it has been installed in the bottom corner of our customer’s garden in Sidcup, Kent to have as a sheltered, entertainment space to enjoy their garden from throughout the year. This large 2.4 x 5.4m Superior Shed has been installed in our customer’s garden in West Malling, Kent to use as a comfortable place to keep and work on their model railway layout, now that they have more time on their hands in their retirement. This 3.6 x 3.0m Superior Shed has been installed for the customer to work on his metalwork projects. It was installed and delivered as part of our end to end service. This Superior Shed is one model from our broader range of timber garden sheds. Included as part of the service is full installation and delivery by our specialist installers, who will make sure your garden building is perfect before they leave. 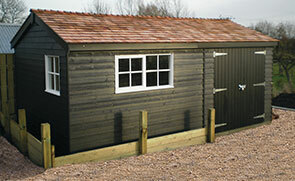 Our heavy duty Superior Shed range is perfect for all types of gardens. Not only are these buildings large enough for a variety of garden equipment, such as garden tables, chairs and ride on lawnmowers, but with the addition of our security pack you can be sure that all of these valuable possessions are stored safely.